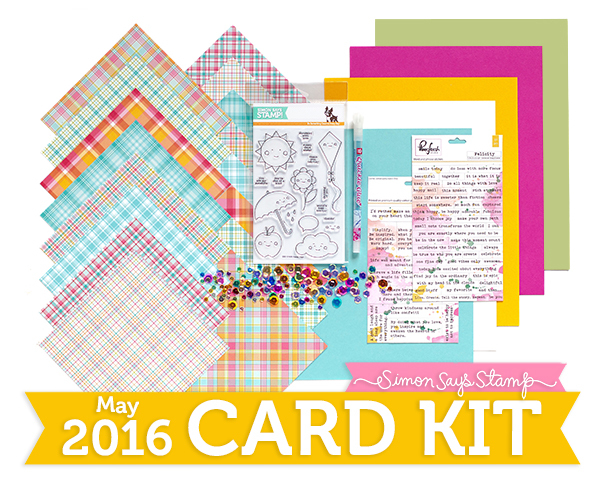 My Impressions: Simon Says Stamp May Card Kit, GIVEAWAY, and 20% off sale! 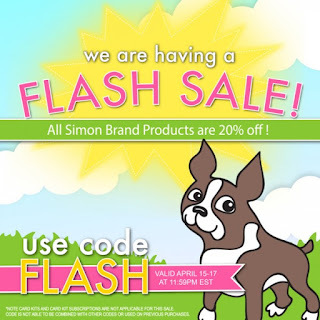 Simon Says Stamp May Card Kit, GIVEAWAY, and 20% off sale! My Simon Says Stamp May 2016 Card Kit arrived yesterday and I've jumped right in. I know I say this fairly regularly but this might just be my new favourite. The Happy Days Stamp Set is absolutely adorable and the Lawn Fawn Perfectly Plaid Papers are delicious! The Simon Says Stamp Crystal Reflections Sequins are a perfect match to the papers and the Sakura Quickie Glue Roller Pen does an amazing job of holding them in place. (I was skeptical). The Pinkfresh Studio Felicity Word And Phrase Stickers include many wonderful sentiments. As usual, the kit also includes some of Simon's own wonderful cardstock. 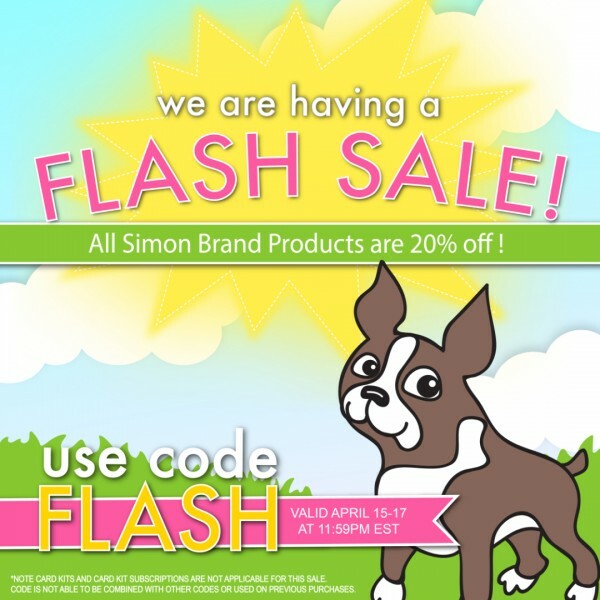 ETA: Simon Says Stamp is having a great sale this weekend (April 15-17) on all Simon Brand Products (Card Kits are NOT included)! Save 20% off using the code FLASH. Oh wow, your card is absolutely delightful. Love the plaid papers and colors are so cool!!! I think it is my favorite too! Great and cute card. Super cute, Sarah .... aren't those plaid papers fun? Oh my goodness! Look at those super cute kites!!! What a cleaver and super cute card. I love it. These kites are too cute! I love the plaid! There are so many pretty colors. Love those kites! Great card! Super cute card! Those plaid papers are awesome! These kits just keep getting better & better. Your card just makes me smile! All those little plaid kites are So fun! those kites are so cute and i love your sentiment! Yes! Another great kit! Those happy little kites will surely brighten someones day. Very fun kit with wonderful paper in it! 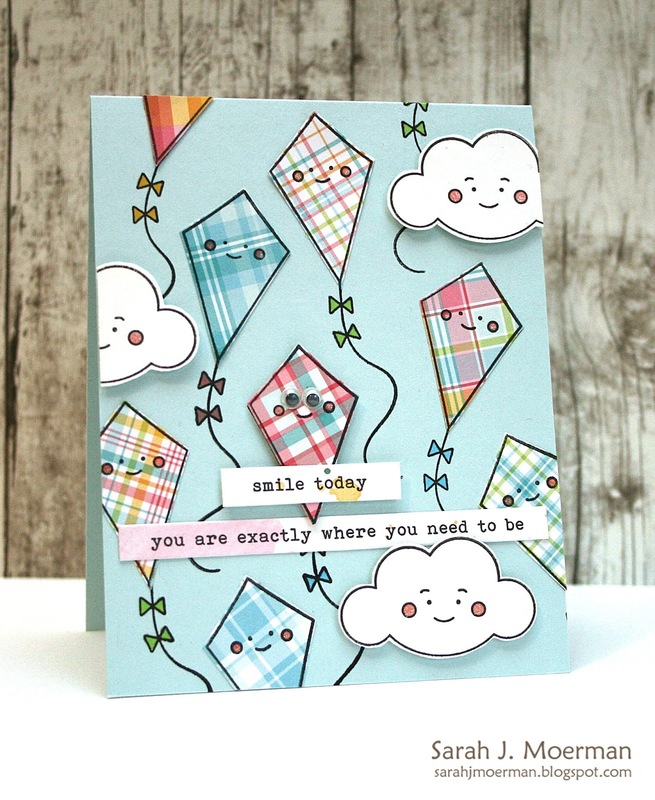 Your kite and cloud card is excellent, so cute, so fun, and so well done! Such a bright and cheerful card. Makes me smile. Great kit! How cute! I love the little faces on the kites and clouds! Sarah you know I always love your creations but this one is just super! I love those plaid kites! Those kites are so adorable. Adorable. Thought I didn't want this stamp....... Now I do! I love this cute card with the sprinkling of kites and how you stamped them on patterned paper. What a cute stamp set and love the googly-eyed kite!!! Your card is so adorable. What a fantastic card kit. Thanks for sharing. Super cute card! I love the patterned paper kites! I'm not normally a "cute stamp" person. But I love kites so this one won me over. You card is the best! Oh my.... This is the cutest card ever! Love those kites! All those kites just made me smile....like the way you used the smiley face part of the stamps!!! And all the fun patterns. You rocked this kit! Love the colors and LOVE the plaid. They have some fantastic images at SSS. It's always hard to pick just a few. I opted to get some of the great colored SSS inks in this sale. Can't wait to get them. I love the googly eyes on the kite. I love kites and clouds so I am drawn to this one on the gallery. Love those colorful kites! I don't do enough paper piecing!